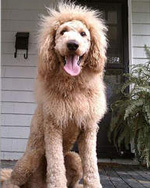 A Labrador-poodle mix in Norfolk, Va., spurred a 911 call of a “lion” on the loose. Cops went to the scene of the sighting while a dispatcher called the local zoo to make sure no big cat had escaped. It turns out that dog owner Chris Painter had shaved his shaggy best friend to look like the beastly mascot of Norfolk’s Old Dominion University. Three blind mice — see how they get their sight back through science! The old nursery rhyme will never be the same after researchers in England restored the sight of totally blind mice by injecting light-sensing cells into their eyes. The new procedure might be able to help cure blindness in some humans. One problem is that scientists still don’t know how much vision has been restored to the mice. 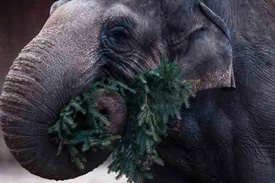 Santa Claus finally delivered a gift to the elephants at Germany’s Berlin zoo — unsold Christmas trees for a luncheon treat. Local vendors donate the pines they haven’t sold at outdoor markets. The elephants, who love the strong smell, had a good time playing with the trees before making a meal of them. Kuehne says the zoo doesn’t accept trees from the public, which could contain chemicals or leftover decorations. He also says Christmas trees inside houses aren’t as fresh and juicy as those at cold outdoor markets — which is just how the elephants like them. A 70-year-old Iowan who spent 65 years looking for his sister finally found her — with the help of an 8-year-old neighbor, who with lightning speed located her via the Web. Chicago foster-home officials in 1948 separated Clifford Boyson, 70, of Davenport, and his sister, Betty Billadeau. When Boyson’s young neighbor, Eddie Hanzlin, learned of the hunt, the kid worked his search magic and found Billadeau living in Florissant, Mo. 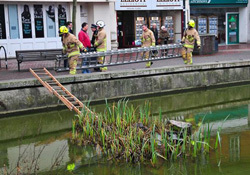 Seven firefighters in one English town rushed in three fire engines to a local pond — all in a desperate bid to save a squirrel that had gotten stuck on a small island. The Watford FD put out a ladder and coaxed the waterlogged creature back onto dry land. No telling how much all that cost, but can you really put a price on that kind of cuteness? From The NY Post and The NY Daily News.